Mykonos. Mykonos is one of the best-known Greek islands and one of most popular Cyclades Islands. 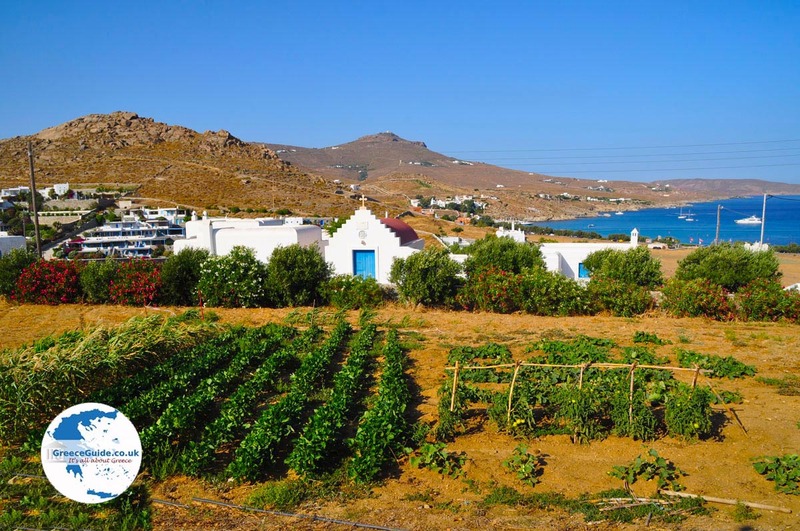 Mykonos Island covers an area of 85 square kilometers (33 mi2) and has about 10,000 permanent residents. Mykonos is bursting with island life, a place where party lovers from all over the world gather to enjoy days and nights full of fun. Every year thousands of tourists come to enjoy the cosmopolitan atmosphere of the island. 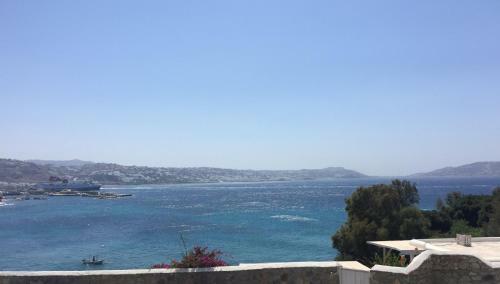 Mykonos, one of the first Greek islands that developed tourism, has become the hot spot in recent decades for many celebrities from around the world. In addition, the island has become a favorite of the gay community. 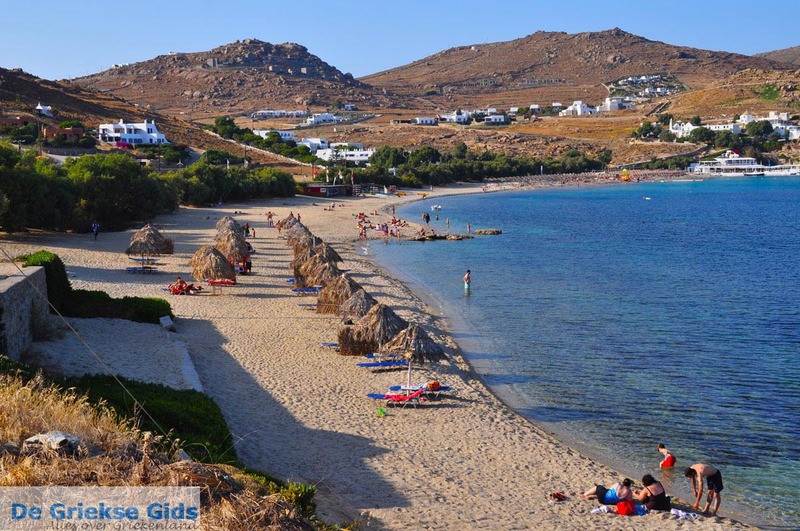 What attracts people to Mykonos is the Mykonos Town itself and the beautiful sandy beaches on the island. 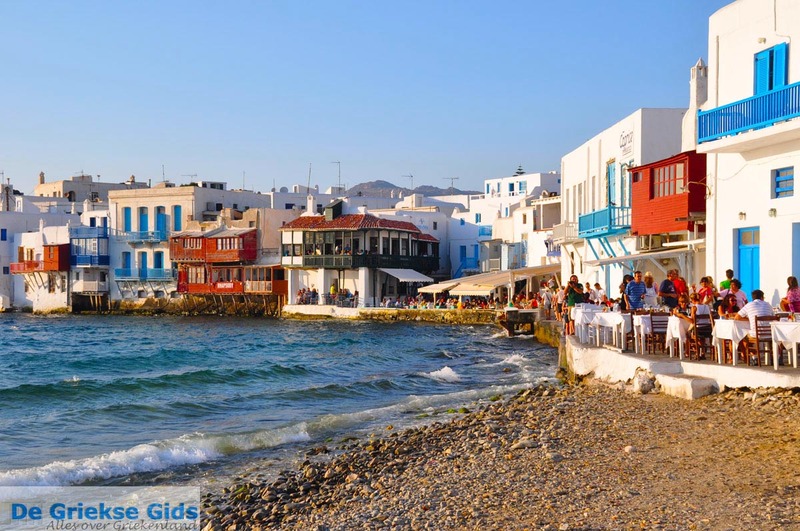 Mykonos Town: Mykonos Town, also called Chora or Little Venice, is a vibrant picturesque town with whitewashed houses and churches, narrow cozy streets packed with shops and the low hill on the water where the world famous windmills of Mykonos are located. These mills been seen in countless posters and famous movies such as "Shirley Valentine," "The Bourne Identity" and "Summer Lovers." 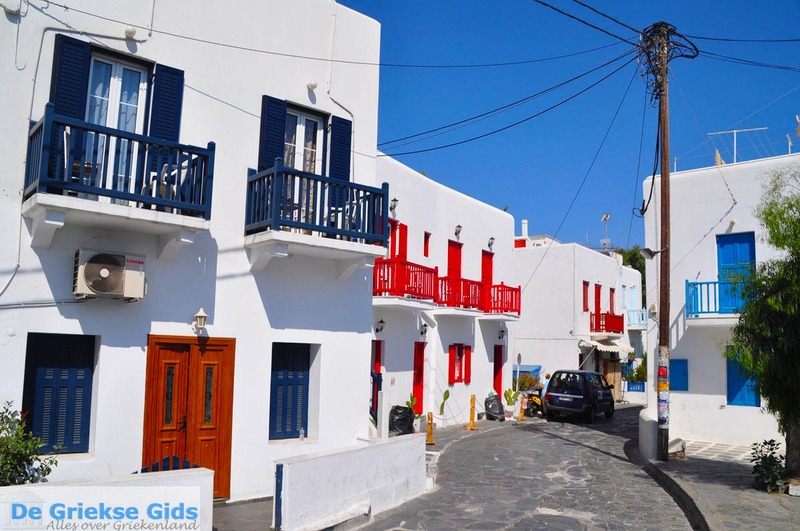 Mykonos Town is a neat town with only white houses where the residents cherish the Cycladic style of their home with heart and soul. 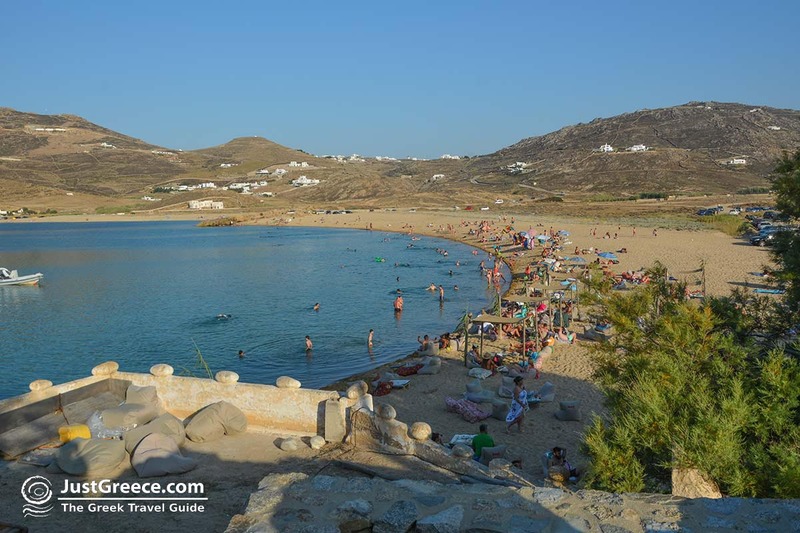 The beaches of Mykonos: It's actually amazing that there are so many beautiful beaches on such a small and rocky island. 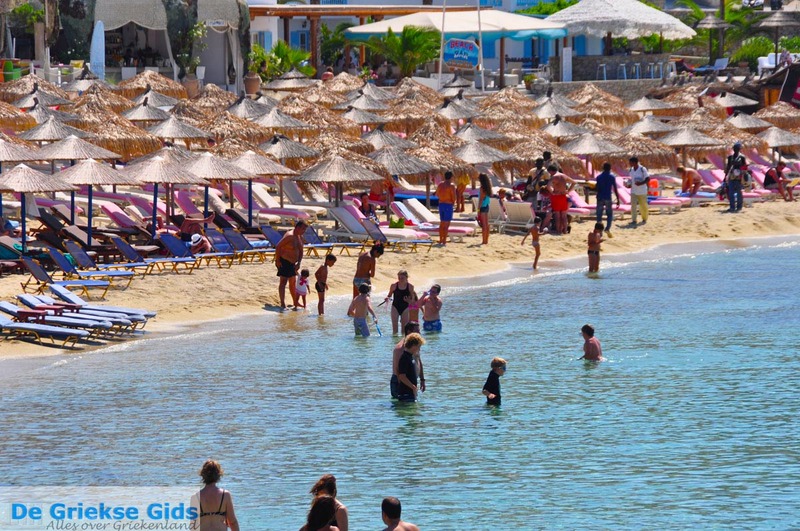 We visited the southern coast and there we discovered the beautiful sandy beaches of Psarou, Ornos, Platis Gialos, Paranga, Paradise, Super Paradise, Kalo Livadi, Agrari and Kalafatis, among others. Remarkably, these beaches have beach bars everywhere and by noon, partying is already underway. 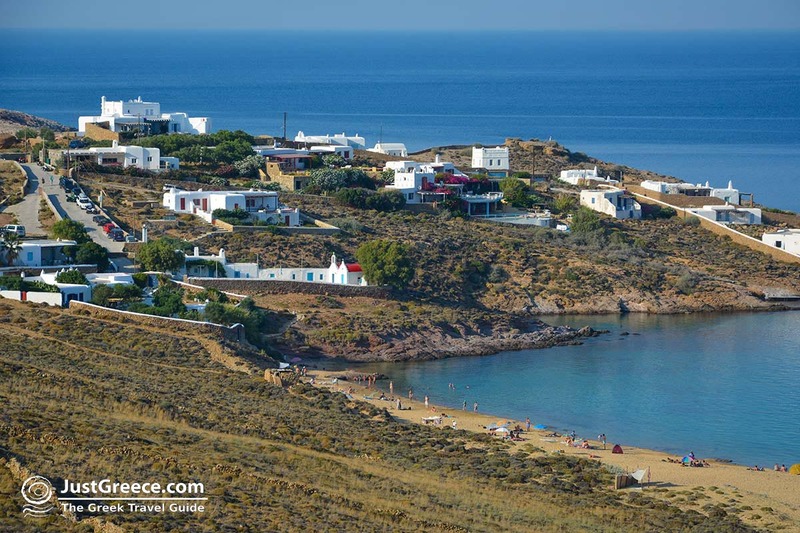 The famous beaches of Ftelia, Panormos, Aghios Sostis, Tourlos and Aghios Stefanos are located on the north and west coasts. 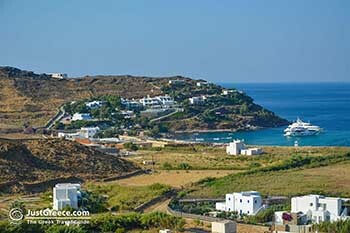 Mykonos is a dry and hilly, rocky island with little greenery and trees. There are a few wheat and grape fields but no other agriculture. The two highest hills are Profitis Ilias Anomeritis in the east and Profitis Ilias Vorniotis in the west. These hills are less than 400 meters (1,300 feet) high. On Mykonos are no plains and no rivers but there is underground water. 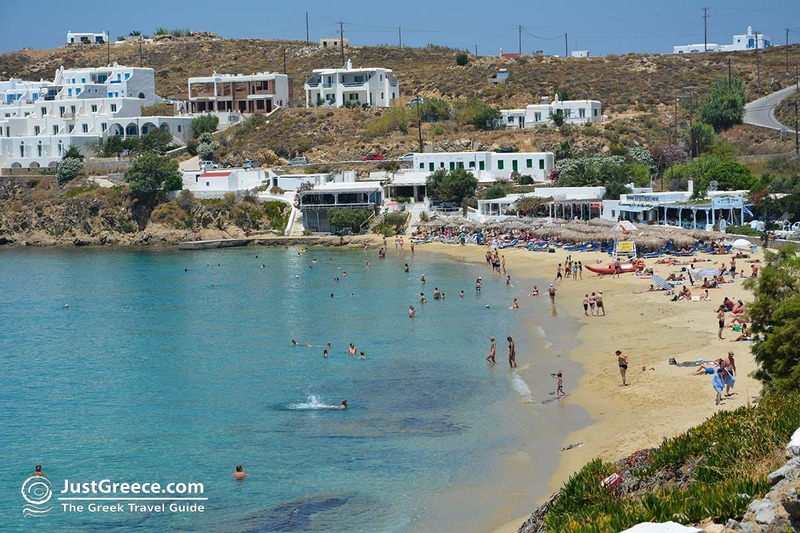 Mykonos has many small bay – you see lots of boats floating on the water. It is said that the island is very rich in raw materials such as manganese, bronze and galena. Yet, there is no mining currently on the island. The roads of Mykonos are pretty good but sometimes very narrow. 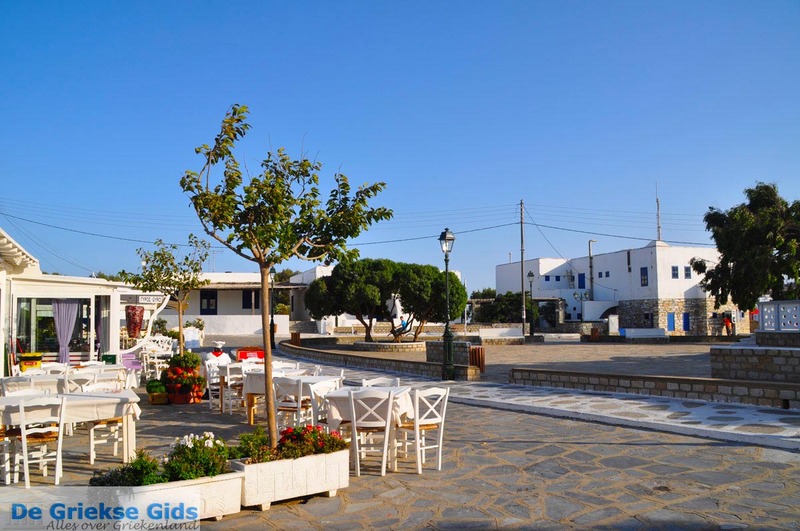 There are some main roads that connect Mykonos Town to Ornos (south), Aghios Stefanos (north) and Ano Mera (east). There are lots of narrow roads that bring you to the most deserted beaches. Most roads are paved, but don’t be surprised if you encounter a dirt road. On Mykonos lots of tourists drive quads. Beware of their dangerous driving! These are often young people who are driving under the influence of alcohol. So always be alert, especially on the narrow roads. On Mykonos, many attractions are definitely worth seeing. - The five wind turbines on the coast. - The Paraportiani church on the edge of the Old Port. - Aleykandra, with its colorful houses with wooden waterfront balconies (hence the name Little Venice). - The narrow, picturesque shopping streets. - The dozens of cozy taverns and restaurants and trendy bars and cafés. 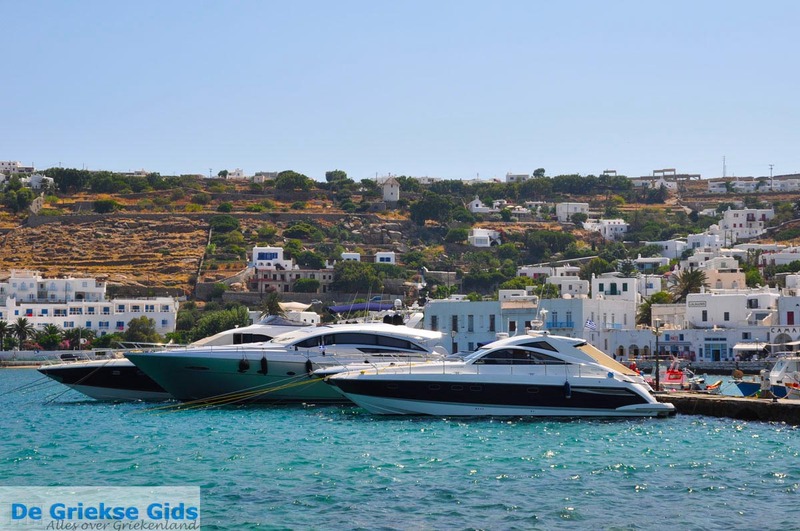 - The old port of Mykonos where fishing boats, yachts and sailboats moor. 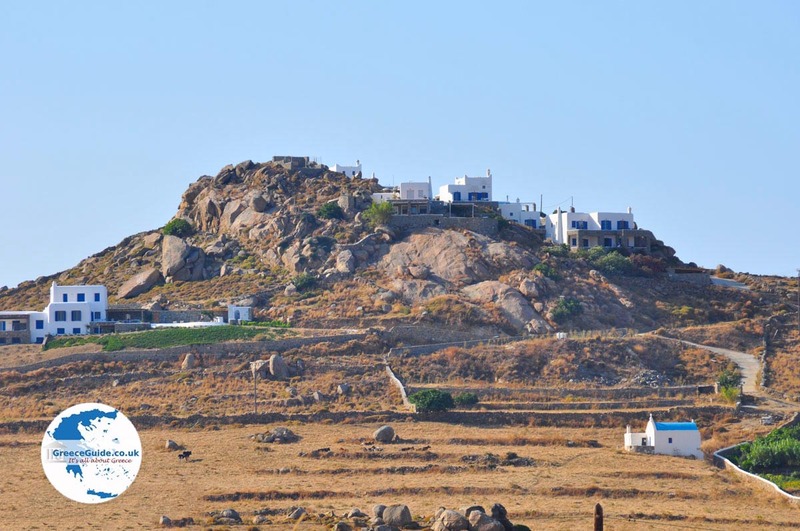 In Ano Mera, the main village outside Mykonos Town, you’ll find the monastery of Panagia Tourliani. Mykonos is accessible by air, both nationally and internationally. The Mykonos airport is located three kilometers south of Mykonos town. However, most tourists are island hoppers, arriving by boat to the island. Many tourists are backpackers, and a good number of others come with organized tours. Mykonos port is connected to the ports of Piraeus and Rafina on the mainland and the ports of all major Greek islands such as Paros, Naxos, Santorini, Syros, Tinos, and Kos, as well as many other islands. 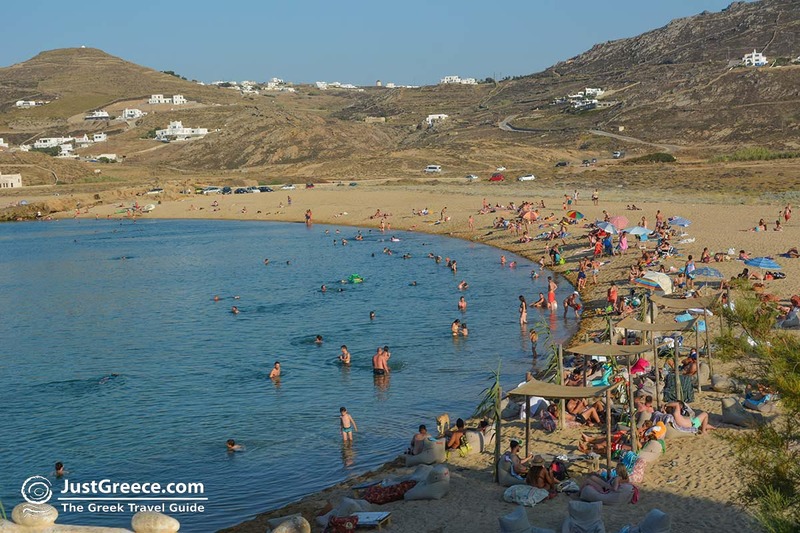 A trip from Piraeus to Mykonos takes three to five hours, depending on the type of ferry (fast or normal) and the stops the ferry may make at other islands. 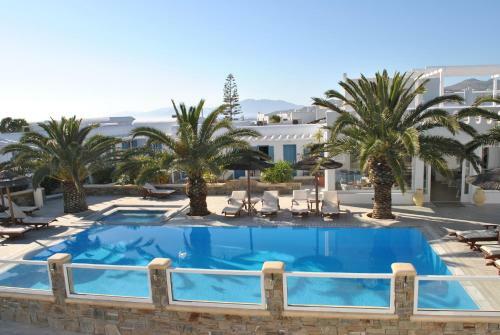 On Mykonos you will find all types of hotels, apartments, studios and rooms to rent. 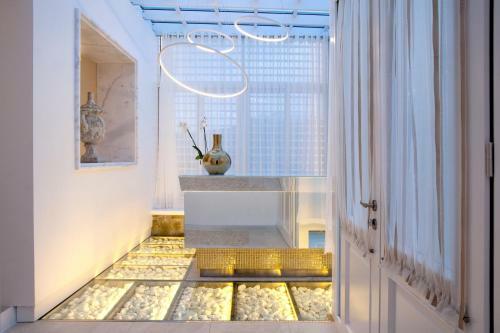 If you want to plan your vacation to Mykonos, many hotels are accessible through the Internet. 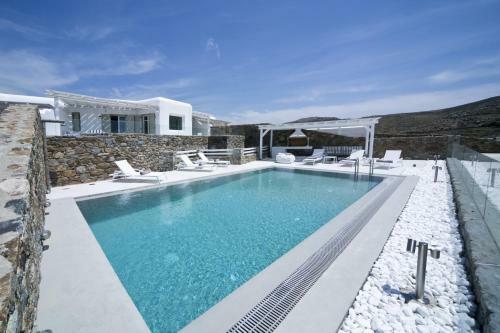 There are also several websites that offer accommodation choices, see accommodations Mykonos. There are a number of campsites on Mykonos, such as Paranga and Paradise beach (Kalamopodi). According to legend, Mykonos took its name from a hero named “Mykonos,” son of demigod Anios (King of Delos) and grandson of God Apollon and nymph Rio. The first inhabitants of Mykonos were Kares and Phoenicians, and after came the Minoans from Crete. In the year 1000 BC, the Ionians from Athens settled here and founded Mykonos. 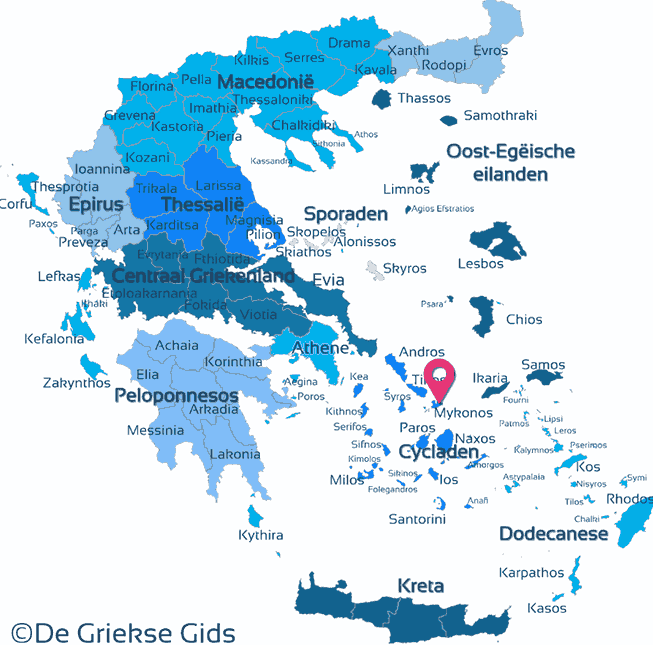 Mykonos then fell into the hands of the Romans, and then the Byzantines came in the 7th century and stayed until the 12th century. Later, in the 12th century, came the Venetians, though the island was frequently attacked and plundered by pirates throughout this time. From the 16th century until in 1830, the Ottomans occupied the island, when the island was liberated and came into the hands of the Greeks. The most famous heroine of Mykonos became Manto Mavrogenous. She was a rich woman that spent all her fortune for the Hellenic cause, the independence of Greece. 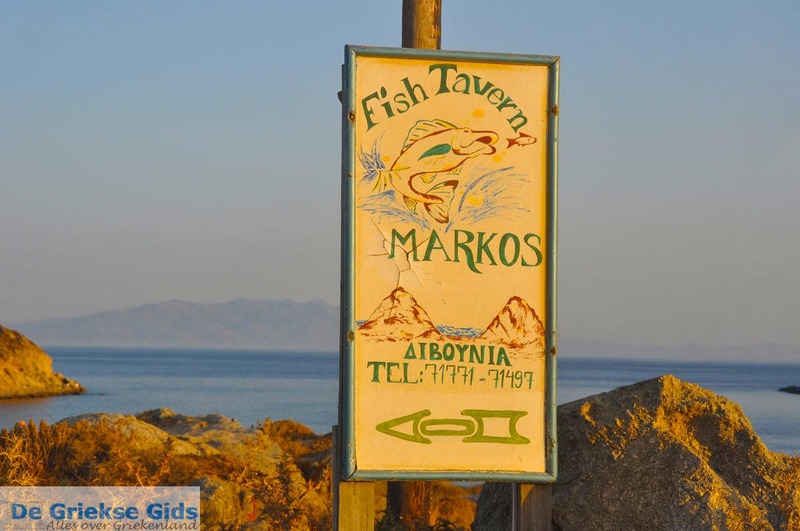 Mykonos: Where on the map is Mykonos located?